Zuchowski: "Assuming that it's going to get done." 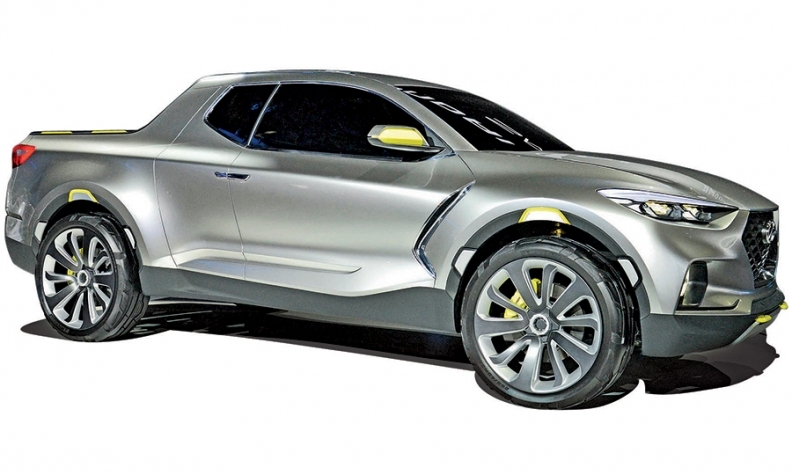 LOS ANGELES -- A small, versatile pickup based on the Hyundai Santa Cruz concept seems to be headed toward production soon, the automaker's top U.S. executive said last week. "We're assuming that it's going to get done," Dave Zuchowski, CEO of Hyundai Motor America, said in an interview. "It's just not officially done yet." Hyundai revealed the Santa Cruz, which was conceived at its Southern California design studio, in January at the Detroit auto show. Since then, Zuchowski and his colleagues have lobbied furiously to build the truck, which would be marketed to buyers who like the utility of pickups but end up with crossovers because they want something smaller and more efficient. Hyundai updates its product plan twice a year. Zuchowski said he expects the Santa Cruz to be approved with the next update. He said it likely would be the first Hyundai sold with a diesel engine in the U.S. If it reaches the market, the Santa Cruz would help ease a shortage of crossovers and trucks that has slowed Hyun-dai's growth in the U.S. Hyundai may also expand its North American manufacturing capacity to address that need; Zuchowski said he expects an expansion plan to be finalized within 90 days. It would be relatively simple to build a mirror image of Hyundai's plant in Montgomery, Ala., he said, but there are concerns about a shortage of trained workers. Some of the workers at the factory live hundreds of miles away, sleeping in rented spaces near the plant and returning home on their days off. An expansion, Zuchowski said, "would really burden the labor force."